Should I choose a polyester tent or a nylon tent? Why is my tent sticky? Is it easy to set up an 8-person tent? What are the benefits of the rod and clip pockets? What are those things that can damage my tent? You will want to choose the best 8 person tent for your family. When you go camping with children and elders, you ought to provide them with a lot of space and comfort- which can be met easily with a spacious 8-person tent. In case you are looking for such a tent, take a look at my article below to see which types of 8 – person tent you might have on the market, some frequent asked questions about 8 – person tents along with my review for the three best 8 person tent reviews available to you in 2019. Overall, there are six types of 8 – person tents you can find on the market, all of which have their pros and cons. The fundamental ridge tent is designed in a way that is very easy to set up while offering you a lot of comfort and convenience. It is also the type that gives you the most stability on the ground. However, the main thing that you need to consider is that it is quite short. It would be just fine for your kids and you in case you intend just to lie down and rest inside the tent. On the other hand, if you and your family members want to participate in various activities inside when it rains outside, it would be quite challenging and inconvenient. For this type of 8 – person tents, you have two options which are 3 – season tent and 4 – season tent. The former is usable through spring to fall while the latter can give you a good shelter in the winter. If you only go camping with your family in the spring and summer, it is better to go with the 3 – season tent. A good product can help your family to stay out of the cool wind or rain while providing you with good air ventilation so that you will cool all of the time inside the tent. On the other hand, a 4 – season tent is much better than the snow. However, it is normally insulated to keep you warm- which might, in fact, make you feel too hot in the summer. This type of 8-person tent- like the name suggests, has a dome-like shape and flexible pole. With this type of tent, you can have the most spacious room inside the tent so your kids would be able to move around freely and comfortably. It is also very easy to set up a dome tent. However, this tent is not as stable as another tent due to its design. 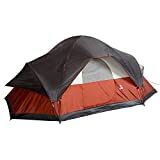 If you still want to buy this tent and don’t want to trade off stability, you can consider choosing one with a smaller size. The convertible tent is the best option for you if you are looking for a multifunctional tent with hybrid design as well as rain fly option to adapt to various kinds of weather such as wind and rain. With the rain fly option, you can easily take it out in the hot and dry summer days and set it back on rainy days. Nevertheless, this type of tent has its weakness, and if you care deeply about the tent’s portability, you might rethink about choosing this 8-person tent. In general, it is much heavier than other types of the tent on the market. It is also known as quick pitch tent which can set up automatically. The frame of the tent is already fitted into the layer of the tent. All you need to do is unleash the knob for the frame to release. Or you can simply throw the tent into the air. This tent is a great choice for beginning campers. Also, it saves you a lot of time on setting up the tent; you can spend more time having fun with your family. One main drawback of this instant tent is that it seems not to be durable and the color of the tent might fade away easily. Frame camping tent is just like the fundamental rigid tent with a strong metal framework. Unlike the rigid tent, you can have a lot of headroom with this tent. It is very heavy and takes a lot of time to set up. Therefore, it is more suitable for expert campers. Nylon tents are more vulnerable to the harmful UV lights while polyester is resistant against such element. Also, polyester tents have much sturdier structural integrity, so stretches or sags would not easily appear on the surface of the tent when it rains or snows outside. On the other hand, nylon tents tend to be cheaper. Therefore, you should go for a polyester tent as it is more durable and weather proof if you intend to use the tent for a long time. And if you only need a tent for a short time, to save money, you can choose a nylon tent. When your tent’s covers seem to stick together, it means that the waterproofing ability of this tent decreases. When the protective layers of the shelter get old and become less effective against water, they would become sticky. In this case, you can check the manual for instructions on how to re-waterproof your tent. It depends on what type of 8-person tent that you have. If you buy instant, self-helping tent, it would be really easy for you to set up as the frame is already connected to the cover. However, some other tents such as the fundamental rigid tent or the dome tent will make it harder for you to set up since they require more pieces and poles. Make sure you read the instructions and guides that come with the tent carefully. You can also be looking for demonstration on YouTube. No matter what you are going to do, make sure you practice several times at home to make sure you don’t have any problem when setting up an 8-person tent. You will see rod and clip pockets in a dome tent. They help to enhance the stability of the dome, which is a weak point of this type of tent. In addition, they help circulate the air around the tent, making more well – ventilated and breathable. There are many things that can degrade the quality of your tent. Firstly, chemical compounds can damage your tent’s layers. When you use a bottle of insect repellent or stove gas, chemicals and harmful compounds might leak out and get into the tent’s layers. Other things such as torch batteries might be harmful as well when the acid from them leaks out. They will penetrate and slowly erode them. Another factor that can harm your tent, especially your ten’s zipper is the sand or dust. When these elements get stuck in the zipper, they will prevent it from working properly and break its structure easily. So make sure you clean the zipper with fresh water frequently. This is a family dome tent for eight people with an attached screen room to make two separate rooms for better privacy. The weight of this tent is 27.3 pounds with the dimensions are 16 x 6.5 x 11 feet (W x H x D). The weather-repellent polyester with polyurethane coating makes it very light; even a teenager can carry it easily. Besides, this tent is quite stable thanks to the roof made of full mesh option with double-stacked power corners. On the other hand, there are two options of colors to choose, including blue and gray. This dome tent provides a lot of space and comfort for your family. With the screen space, you can use it in various ways such as a bug-free eating room or play room as it provides a lot of sun light during the day. It is extremely breathable and well ventilated so that you can feel cool all day long during hot summer time thanks to the design of the lower zippered vent and screened in porch. Two separate rooms can provide you with the design of a living room and a bedroom so that you can keep the sleeping space clean and free of dirt. The screen room is better to use in the days or hot nights rather than cool nights. It would take around 20 minutes to set up the tent, and it would be longer if you set it up for the first few times. Compared to Wenzel 8 Person Klondike Tent, this 8-person red tent has three different rooms. It comes with the center height of 72 inches and width of 17 by 10 feet. Among three camping tents, this Coleman is the lightest, which is 24.4 pounds. The tent features an exclusive technology of Weathertec system to keep you dry regardless of how heavy the rain is. Ignore those basics; this feature is my most favorite. Because I am a hot sleeper, which makes me hard to sleep well at night. But thanks to God, this Coleman tent features a Cool-air port and Variflo ventilation system. And I must say that it saves my life! This tent is very easy to set up, and even only one person can set up this tent with the color coded poles, you will know where to put the poles. Along with the easy assembly instructions, you will be able to assemble the tent in the first go. The surface of this tent is made with high-quality material to be highly resistant against water and rain. With the highest technology in the air port and venting system, this tent is well ventilated and breathable to keep you and your family members cool during the hot summer days and nights. It is the best 8 person tent for anyone on a tight budget. The seam of the main pole support sleeve is poor. So, when there is tension in the pole from the bend, it starts tearing apart. The window which is attached to the hinged door cannot close, which might make you cold when the wind breezes in. Like the Wenzel, this dome tent has two separate rooms for better privacy. The height of the tent is 76 inches in the center. Contrast to the Coleman; this Columbia is the heaviest, which is about 32.2 pounds. The amazing things are that it is made of 150 D Polyester, the same with the Wenzel. 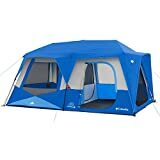 The outstanding feature is this Columbia tent might be the covered Velcro window, two adjustable ground vents and one utility port for sealed power cord access. You know that polyester camping tent is poorly insulator. By adding this vent, the manufacturer can overcome that weakness of their product. Awesome! Besides, there are also gear pockets to help you keep your personal belongings organized and within reach. The material is waterproof, and the design of the tarp helps to prevent rain from coming into the tent very effectively. Two separate rooms can provide you with the design of living and sleeping room so that you can keep the sleeping space clean and free of dirt. This tent is a little bit heavier than other 8 – person tents you can find on the market. Overall, there are a lot of different types of 8 – person tents for you to choose. They are also varied in weights, heights, materials and interior design. I hope with all of the information above; you would be able to find an 8-person tent that meets all of your preferences and needs. With a good and comfortable tent, I am sure that you can spend a lot of high-quality time bonding with your family and gain a lot of memories from these trips.